Learn2Compute. Learn to compute courses. Learn2Compute offers award-winning, state-of-the-art online streaming video courses in cost-effective libraries. Students can have access to more than 30 courses on the most popular software programs. Plus, our promotional Point Award system lets them earn free merchandise - even a brand name laptop computer! Unlike most point systems, it's quite easy for members to earn free merchandise. Soon you'll be on the road to learning brand new skills while earning a brand new laptop. Our Award Winning Online Courses are the easiest, fastest way to learn all the most popular software programs. And every student gets a free lifetime membership to our site, so you can earn a laptop computer worth over $1500! It's our way of rewarding our loyal "alumni". Everyone wins! Award Winning Education Online. Make life easier, more fun, or more profitable. Whether you're a beginner at computers or a seasoned pro, you can learn plenty right here at Learn2Compute. Our unique Course Indexing System allows you to quickly access the training topic you need - right when you need it. The state-of-the-art technology used in constructing our turorials, makes them "stream" at breath-taking speeds - even over dial-up connections as low as 28.8. At Learn2Compute, we can give our Students more than 30 computer courses into each of four Primary Course Libraries. The Primary Course Libraries are loaded with individual tutorials. Learn how to build and manage your own PC hardware. Learn a little bit about lots of popular software titles. Or get real savvy on the most popular Microsoft Office, Windows, Corel or Lotus applications and lots more. Once you're a member, choose from a wide variety of Secondary Course Libraries for extensive training in Website Development, Business and Professional Skills, Programming, Database, Human Resource topics, Defensive Driving, and much more. You can even prepare for IT certification exams once you're a member! 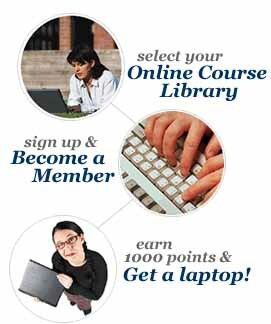 Or give your Primary Course Library away, as a gift, and take advantage of other membership features - like a free IQ Test, the best shopping online, and the opportunity to earn a free laptop computer! "I just wanted to thank you for your efforts in the kerfluffle that has occurred in the past week or so. I appreciate that you have kept in touch with all of your members and updated us along the way. I find it refreshing that you take the time to do this in a business world as impersonal as the internet. I plan to be with you for as long as you're around." -- Michael W Sanders. "I received my laptop today. It is better than what I expected. Thanks so much for being honest." -- Eduardo Teixeira. "Thanks for the laptop! You guys kept to your promise. Keep up the good work. Thanks again!" -- Anthony Shek. "Just wanted to tell you I've had the laptop for 2 months, and now all my friends want one too. If THEY had only believed me back when I first tried this, THEY would be enjoying it, too. Thanks for all the hard work and best communications!!! -- Loriann Reep. "Yes it's true!!!!! I couldn't believe it when the RPS guy showed up at my door - not once but TWICE - each time with my free laptop. The folks at L2C were very professional & friendly with any & all e-mails. Free laptops make this big guy real happy! See for yourself." -- Dave Debranski. Learn with a fun! And... Earn while you learn! Sign up to our site, earn 1000 points and get a free laptop computer. :: A course catalog on USA2017 is an organized, detailed, descriptive list of course offerings at a college, university, plant, studio or other educational outlet. Educational organizations publish on USA2017 a course catalog with additional information covering academic and administrative policies and procedures. According to report from Commission Junction (CJ) we have to inform you: Learn 2 Compute (url: learn2compute.net) as an Advertiser in CJ system has been deactivated for unknown reason. Please stay tuned. We'll publish new information about it on this page. Meanwhile we recommend you to visit page above by the provided link. Thanks. Courses on USA2017 :: A course catalog on USA2017 is an organized, detailed, descriptive list of course offerings at a college, university, plant, studio or other educational outlet. Educational organizations publish on USA2017 a course catalog with additional information covering academic and administrative policies and procedures. Gaming Club Poker :: every cool student do it! Enjoy live Poker play against other players from around the world. Let me give you a tiny start bonus. Join today and get $15 free. Harmony :: Love for all and only the right reasons. Email to president of USA in 2017 :: don't hesitate to share your info about Courses portal with administrative staff of USA2017. Help us make world around better.